Throughout history civilizations have been born and lost countless times. In modern times through our accumulation of knowledge, anthropologists and archaeologists have tried to piece together a timeline of the rise and fall of civilizations. However, through new discoveries and the hard work of many researchers, more previously unknown civilizations are being looked at in a new light. All of these are ancient and they are a sign of the major probability that we do not know as much as we would like about our history as we believe we do. One of the most famous stones left behind is the ‘Unfinished’ Obelisk, taller than any known obelisk ever raised. 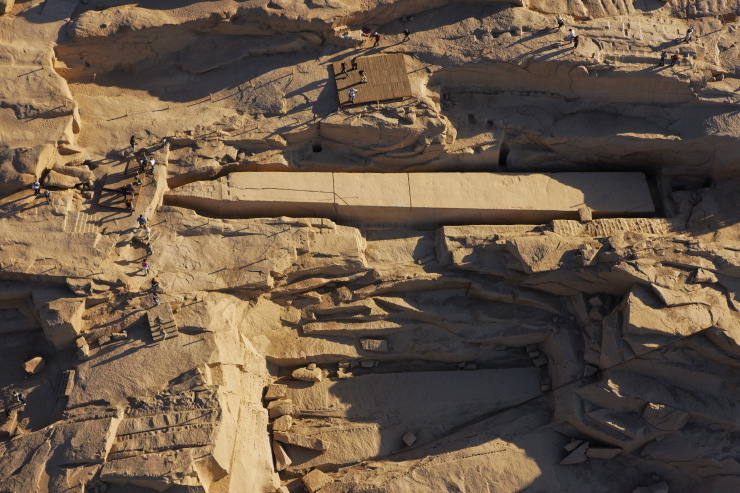 The unfinished obelisk is the largest known ancient obelisk and is located in the northern region of the stone quarries of ancient Egypt in Aswan (Assuan). It is 42m in length and was most probably abandoned when some cracks appeared in the rock, during its construction. Others believe that the female pharaoh known as Hatshepsut sanctioned its construction. If finished it would have measured around 42 m (approximately 137 feet) and would have weighed nearly 1,200 tons. Besides the unfinished obelisk, an unfinished partly worked obelisk base was discovered in 2005 at the quarries of Aswan. All these quarries in Aswan and the unfinished objects are an open-air museum and are officially protected by the Egyptian government as an archaeological site. Dwarka is one of the most ancient cities of India. The city, five miles long and two miles wide, is located 120 feet underwater in the Gulf of Cambay off the western coast of India. The discovery was particularly astonishing to scientists as the area predates all other finds in the area by at least 5,000 years, suggesting a much longer history of the civilization than was first assumed (carbon dating estimates the site to be almost 10,000 years old). Marine scientists used sonar images and sum-bottom profiling to locate the lost ruins and it is believed the area was submerged when the ice caps melted in the last Ice Age. What’s surprising is that many architectural remains are still intact. This incredible find has been named Dwarka (The Golden City) in honor of the Hindu god, Krishna. 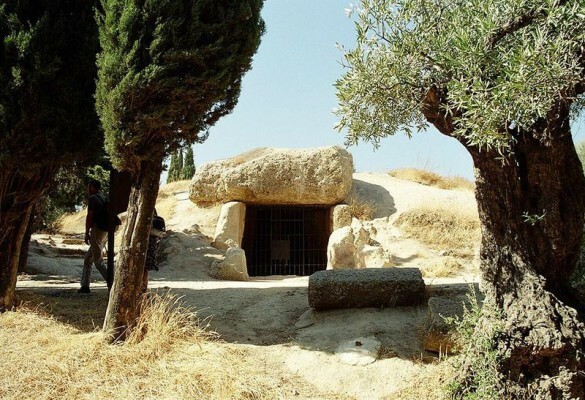 The Dolmen of Menga (Spanish: Dolmen de Menga) is a megalithic burial mound called a tumulus, a long barrow form of dolmen, dating from the 3rd millennium BCE. It is near Antequera, Malaga, Spain. It is famous for being one of the largest structures in Europe, if not the world. Largest stones estimated at 180 Tons. Built on a natural mound, the main chamber is composed of five capstones supported by three squared pillars, cut into the stones that compose the floor. Anthropomorphic scenes are recorded on its walls. When the grave was opened and examined in the 19th century, archaeologists found the skeletons of several hundred people inside. Older than Stonehenge and the Pyramids, Ggantija Temples in Xaghra, Gozo, are one of the most important archaeological sites in Malta. These two temples are notable for their gigantic Neolithic structures, which were erected during the Neolithic Age (c. 3600-2500 BC). The ruins had been noted since 1772 and the remains were ‘cleared’ (not excavated) in 1827 under Colonel Otto Bayer. The Ggantija megalithic complex consists of two temples surrounded by a massive common boundary wall, which was built using the alternating header and stretcher technique, with some of the megaliths exceeding five meters in length and weighing over fifty tons. Just remember that all this was built in a time when there were no metal tools and no wheels. It is considered that Ggantija might have represented the location of a fertility celebration, as figures and statuettes linked to fertility were discovered there. Due to the gigantic dimensions of the megaliths, in past centuries some locals believed that the temples were the work of giants. According to an ancient legend, the temple walls were built in one day and one night by a female giant named Sunsuna, who did it while nursing a baby. Ggantija is Maltese for “giant’s grotto.” However, modern calculations would suggest that the southern temple alone would have taken some 15,000 man-days to construct. Extensive archaeological and restoration work was carried out in the early 20th century to ensure their preservation. Because of their uniqueness and beauty, the major temple complexes are deservedly designated as UNESCO World Heritage Sites, collectively named as “The Megalithic Temples of Malta”. The Yonaguni Monument is a submerged rock formation off the coast of Yonaguni, the southernmost of the Ryukyu Islands, in Japan. 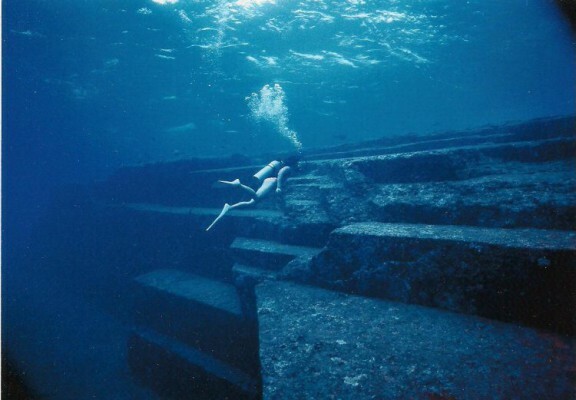 In 1986, a diver (Kihachiro Aratake) near the island of Yonaguni Jima, came across some strange structures about 25 metres below sea level. Aratake was stunned by massive rectangular formations with perfect 90 degree angles, straight walls, steps, columns and what appears to be a human face carved in the rock. The monument is made of sandstone, and is derived from the same singular rock formation, a staggering rectangle 150m by 40m and reaching 27m in height. The enormous stone monument consists of a flat platform covered with elaborate ornament, perfectly flat steps and terraces of unusual shapes. Many other interesting objects, including sculptures made of stone that resemble animal figures, have been discovered both on land and in the sea around the structures. Masaaki Kimura, a marine geologist from Japan’s Ryukyus University, has been studying and mapping the site for over 15 years and believes that the site is over five thousand years old but was sunk during an earthquake two thousand years ago. Others have estimated that the structure is far older. However, this construction is not alone. 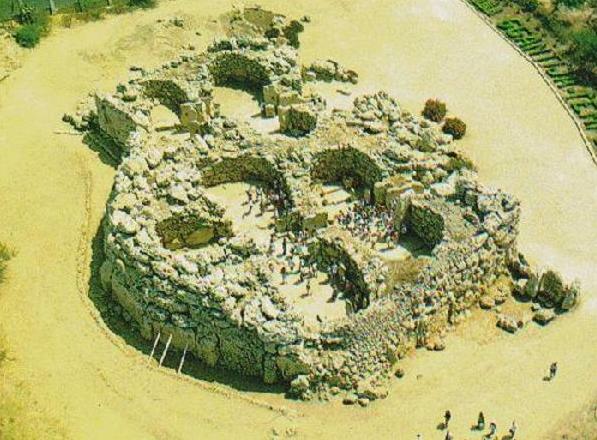 Alongside the monument ten other structures have been found on Yonaguni, including a castle, five temple-like structures, and what seems to be a huge stadium. What is more interesting is that all of these structures are connected by roads and water lines. 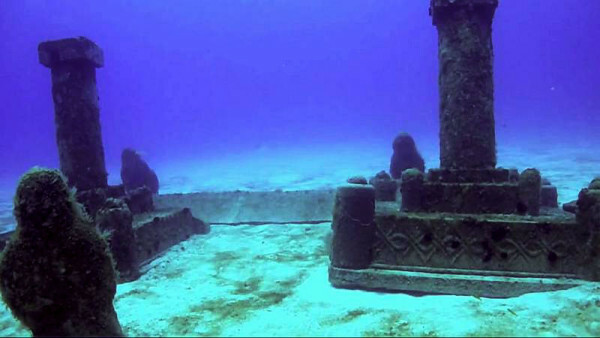 The Yonaguni monument is surrounded in mystery. It has been swept under the carpet of mainstream human history and in the process could wipe out a key period in Asia’s ancient history. The Olmecs were an important early Mesoamerican civilization which had much influence on later cultures such as the Aztecs and the Maya. The Olmec culture thrived along Mexico’s gulf coast from roughly 1200 to 400 B.C. They were extremely talented artists and sculptors: they produced many statues, celts, masks, figurines, stelae, thrones and more. 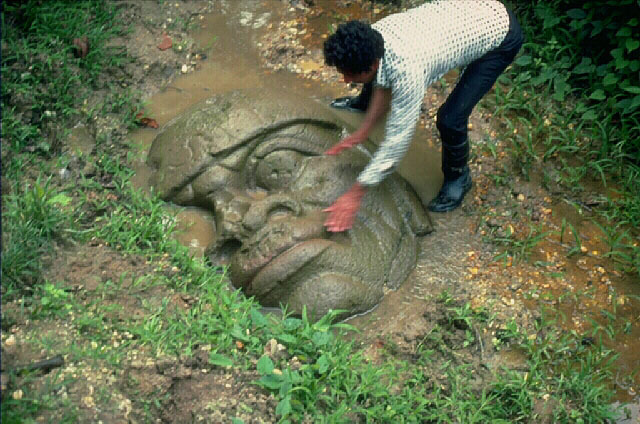 Best known for their massive colossal heads, seventeen of which have been found at the three most significant Olmecs sites in Mexico (La Venta, San Lorenzo and Tres Zapotez). Almost all of these colossal heads bear the same features, flattened nose, wide lips, and capping headpiece. It has long been suggested that the stone heads represent warriors or chieftain leaders, or perhaps a ruling dynasty. The heads were carved from huge basalt boulders, some quarried in the Tuxtlas Mountains; some from the basalt of Cerro Cintepec; others from basalt found on San Martin Volcano. There has been a great deal of controversy about these heads with many African groups claiming that these heads that show seemingly African features are evidence that there were great civilizations in Africa that were sailing around the world long before the Europeans. Archaeologically categorised as a site of the Pre-Pottery Neolithic A Period (c. 9600–7300 BC), Göbekli Tepe is a series of mainly circular and oval-shaped structures set on the top of a hill; massive carved stones, crafted and arranged by prehistoric people who had not yet developed metal tools or even pottery. 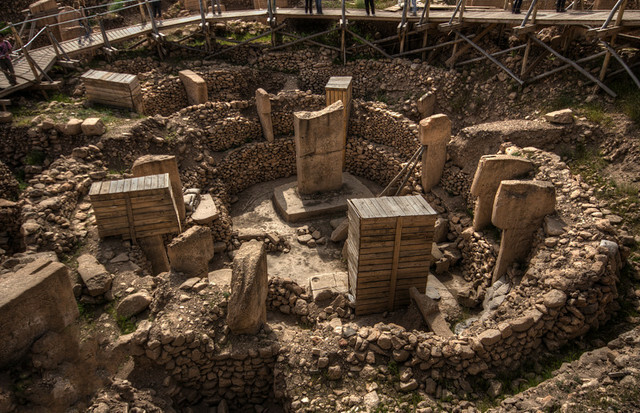 Göbekli Tepe is situated on a flat and barren plateau, with buildings fanning in all directions (the megaliths predate Stonehenge by some 6,000 years). The site was first noted in a survey conducted by Istanbul University and the University of Chicago in 1963. Subsequently it became apparent that Gobekli Tepe consists of not only one, but many of such stone age temples. Excavations began in 1995 by Prof. Klaus Schmidt with the help of the German Archaeological Institute. Schmidt is convinced it’s the site of the world’s oldest temple. Göbekli Tepe is regarded as an archaeological discovery of the greatest importance since it could profoundly change the understanding of a crucial stage in the development of human society. Future plans include construction of a museum and converting the environs into an archaeological park in the hope that this will help preserve the site in the state in which it was discovered. “A 12,000-year-old temple that is being excavated in Turkey is rewriting the historical record and seems to belong to a larger, hitherto unknown civilization that is slowly being uncovered“ Philip Coppens. The Carnac stones are an exceptionally dense collection of megalithicsites around the French village of Carnac, in Brittany, consisting of alignments, dolmens, tumuluses and single mehirs (large upright standing stones). The Carnac megaliths are built in long straight lines, some over a kilometre long and containing gundreds of mehirs per row. With over 100 monuments, Carnac is the site of the largest concentration of megalithic monuments in the world. Researchers believe that the erection of the Carnac megaliths began sometime in the Neolithic period about 4000 BC and perhaps continued to be built for the next 2000 years.There are three major groups of stone rows: Menec, Kermario and Kerlescan – which may have once formed asingle group, but have been split up as stones were removed for other purposes. Menec – eleven converging rows of menhirs stretching for 1,165 metres, by 100 metres wide. Kermario – it consists of 1029 stones inten columns, about 1,300 metres in length. Kerlescan – a smaller group of 555 stones, further to the east of the other two sites. It is composed od 13 lines with a total length of about 800 metres, ranging in height from 80 cm to 4 metres. Many believe they have an astronomical function as a marker or foresight. Others think, it’s an enormous cemetery, because passage graves are found here (one myth isthat they were Roman soldiers turned to stone by the wizard Merlin). 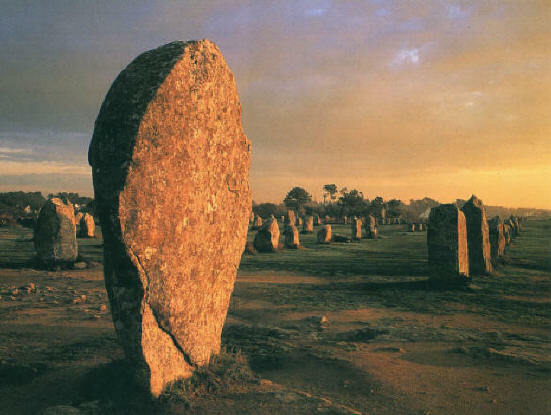 But, as with other megalith sites, not everyone can agree on the original function of the giant stones, leaving Carnac the site of another mystery which may never be solved. Carnac is one of three sites on Earth that is said to be seen clearly from outer space. The other two locations are said to be the Great Wall of China and Nazca lines in Peru. The stone balls are one of the strangest mysteries in archaeology discovered in the Diquis Delta of Costa Rica. Since the 1930s, hundreds of stone balls have been documented, ranging in size from a few centimetres to over 2 metres (6.6 ft) in diameter. The archaeologist and anthropologist Samuel Lothrop recorded a total of approximately 186 balls for his 1963 publication. Today, around 300 balls are known to exist and it has been estimated that the largest ones weigh over 16 tons (15,000 kg). Almost all of the balls are made of granodiorite, a hard, igneous stone that outcrops in the foothills of the nearby Talamanca range. These rocks are thought to have been built between 1000 and 500 B.C. by a population that has vanished since then, although actual dating is difficult. Numerous myths surround the stones, such as they came from Atlantis, or that they were made as such by nature. Some local legends state that the native inhabitants had access to a potion able to soften the rock. Although the rocks have been affected, broken and worn over thousands of years, some believe these stones were initially designed as perfect spheres. What were they used for? Nobody knows for sure. 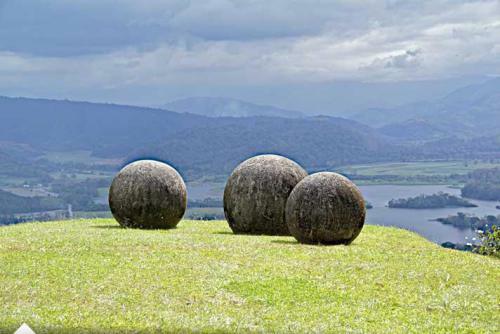 The stone balls of Costa Rica have been the object of pseudoscientific speculations since the publication of Erich von Däniken’s ‘Chariots of the Gods’ in 1971. The ancient stone spheres were made world-famous by the opening sequence of “Raiders of the Lost Ark,” when a mockup of one of the mysterious relics nearly crushed Indiana Jones. Easter Island is a Polynesian island in the southeastern Pacific Ocean, at the southeasternmost point of the Polynesian Triangle. Easter Island’s most dramatic claim to fame is an array of almost 900 giant stone figures, that date back many centuries; monolithic human figures, called Moai, carved by the Rapa Nui people between the years 1250 and 1500 CE. The statues reveal their creators to be master craftsmen and engineers, and are distinctive among other stone sculptures found in Polynesian cultures. There are 887 known Moai statues, the tallest being 21 meters (72 feet) high, weighing over 160 tonnes (176 tons), and the average height is 4 metres (13.2 feet). The Moai statues have large heads and bodies with sharp noses and chins, and nearly all are carved from volcanic stone called ‘tuff’. 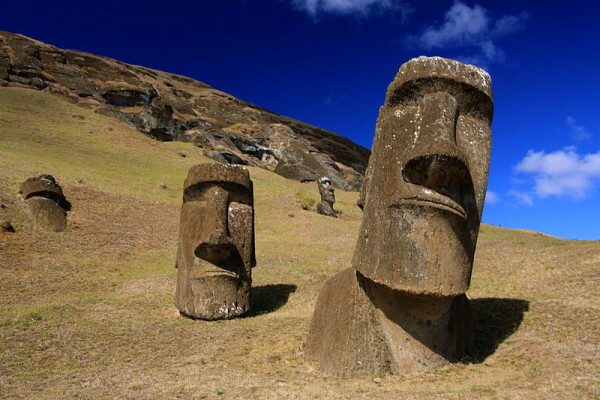 It was thought for a long time that the Easter Island statues were just heads. But a dig almost 100 years ago showed that buried beneath the surface were the statues’ bodies. Images from the excavation of the statues has revealed that the “bodies” are marked with detailed “tattoos”. The Easter Island statues have remained one of the world’s best-kept secrets. The Moai statues are part of the Rapa Nui National Park, which was made a UNESCO World Heritage site in 1995. There has been much speculation about the exact purpose of the statues, the role they played in the ancient civilization of Easter Island and the way they may have been constructed and transported. Previous Article← What U.S. Targets Would Aliens Attack if ‘Independence Day’ Was Real?